To start the game, each player chooses one of the seven over-sized hero cards, each of which has a special power, and starts with a deck of ten cards. 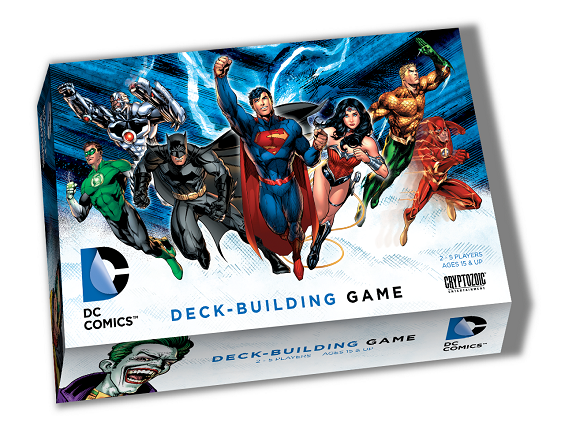 Each turn, a player starts with a hand of five cards and can acquire or conquer the five types of cards in the game: heroes, villains and super-villains, equipment, super powers, and locations. To defeat villains, you'll need to have power – but when a super-villain is defeated, a new one comes into play, attacking all the heroes while doing so. Make sure you've acquired defenses – like superspeed or bulletproof powers, or The Batsuit equipment – to protect yourself from harm.